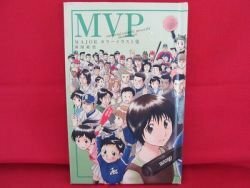 Title :MAJOR 'MVP' illustration art book /Anime,Takuya Manda Language : Japanese. This is an official book. Release Date : 2010 Total Pages : 80 pages Condition : USED. Very Good. No missing page. Description:This is a Japanese Anime (Manga) "MAJOR" Art Book (Illustration Book).